Millions of lives were at stake  indeed, the future of the world as we know it. Yet chaos reigned. No-one knew what was going on. People who hadnt slept for three days were manically running one way, then another. The final day of Copenhagen was like being in some kind of slow motion disaster movie; except the disaster is far from fictional. If not quite Apocalypse Now, it certainly felt like Apocalypse Soon. When I first arrived at the Bella Centre  the cavernous vortex in which the UN climate negotiations were taking place  I didnt have high expectations. No-one did. In the preceding weeks it had become clear that industrialized countries simply werent coming forward with the deep emissions cuts and finance for developing countries that are the essential building-blocks for a deal to drag us back from the brink of dangerous runaway climate change. So the question of whether thered be any deal at all was going to go down to the wire in the final two weeks of intensive negotiations in Copenhagen. 1. The Alliance of Small Island States made a proposal that, based on the predictions of climate scientists, the final agreement needed to set the target of keeping global warming under 1.5 degrees. Otherwise, their entire nations would be wiped out by rising sea-levels, and many African and glacier-dependent countries would be devastated. 100 developing countries supported this. But industrialized and emerging nations ignored it, stubbornly sticking to a nominal 2 degrees target, but not pledging the emissions cuts for even that. 2. The UN process was being bypassed. Select groups of countries were being hand-picked by the Danish Government and encouraged to have behind-closed-doors discussions in order to stitch up a weak deal away from any democratic scrutiny or accountability. 3. Bullying and arm-twisting was reaching WTO-like proportions. There are many examples: Lesotho, head of the Least Developed Countries, was told decisions on the extension of $7 million in aid will be dependant on its co-operation in Copenhagen. Palau was told a US funding package would be decided soon, so it should support the USs pathetic emissions reduction target. Bangladesh was told by the UK it would only get money for adaptation to climate change if it agrees to the finance going through the World Bank  a body that has brought nothing but misery to many developing countries. 4. 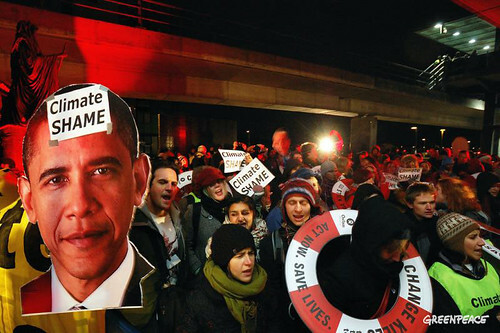 The US was determined to kill off the Kyoto Protocol. Despite its flaws, Kyoto is the only legally-binding international treaty that mandates emissions cuts from industrialized countries. In a press conference I attended, Todd Stern, Chief US negotiator, was as blunt as a poke in the eye. The US won't sign Kyoto. Its as simple as that. It doesn't mean there aren't important elements we wouldn't keep. The elements we created, such as emissions trading and carbon offsetting  we are very comfortable with those. But the overall Kyoto architecture, no. African nations objected so strongly that they walked out and the official COP process had to be suspended for a couple of days. 5. Halfway through the fortnight, small areas of progress were starting to be vetoed. Out of the blue, the US started bracketing text it had formerly seemed happy with in the negotiations to protect the worlds forests. They also yanked away their support for so-called bunker finance  a tax on emissions from aviation and shipping that could raise funds to help poor countries adapt to climate change. It was the one area in which all industrialized nations were in agreement. Then the US blocked it. 6. The finance was nowhere to be seen. Under Kyoto, rich nations are obliged to financially support poor nations with the costs of adapting to climate change and mitigating its worst effects. $400 bn a year is needed. That money has never materialised and remained conspicuous by its absence. Hillary Clinton added insult to injury by bathing herself in glory announcing a breakthrough $100bn financing package. It was nothing more than smoke and mirrors: existing aid repackaged, money from carbon offsets that would be spent anyway, and loans so that poor nations could get further into debt. 7. The whole deal, such as it was, was riven with loopholes and false climate solutions that would make things worse: carbon markets which allow industrialized countries the illusion of buying their emissions reductions from elsewhere rather than making them domestically; biofuels that drive famine, and scary geoengineering projects. Anything, anything so we can keep on burning those precious fossil fuels. It was all going so badly that no deal was looking much better than a bad deal. 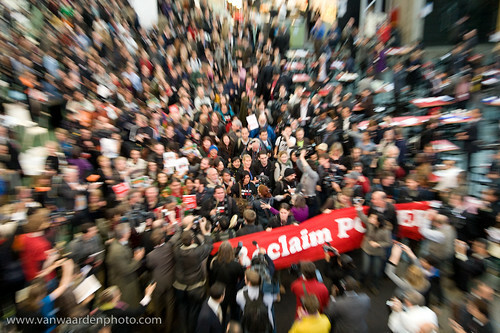 Despite the best attempts of the Danish police to baton-thwack then pre-emptively arrest every single dissenting voice in the city (over 2,000 peaceful demonstrators were arrested, many of them put in cages and pepper sprayed), the protests that were taking place every day out on the streets spread inside the Bella Centre. There were numerous tame little flashmobs and press stunts during the first week. Then in the second, the action got more direct. There was a stage invasion by Climate Justice activists, and an all-night sit-in by young people. I took part in the biggest inside action: a mass march-out of accredited attendees, including delegates from several different country negotiating teams, on the second Wednesday. Led by indigenous peoples, we marched together through the Bella Centre. Showing our disgust at the state of the negotiations, we drew claps and cheers from bystanders as our shouts of Reclaim Power reverberated through the vast building. I nearly died in the media scrum. We were, outrageously, threatened with arrest and police violence if we continued outside to meet our fellow protesters who were trying to march in. But we were determined to come together and hold a Peoples Assembly where we would discuss the real climate solutions, so absent from the formal talks where the untouchable idols of economic growth and market-based solutions reign supreme. Leaving the fossil fuels in the ground. Recognising and paying the rich worlds climate debt to the poor world. Reducing Northern consumption patterns. Making the transition to peoples control of food, land, water and energy so as to follow a multiplicity of pathways to a climate-friendly future. All these things are achievable, effective, and absent from the formal process. So those of us in a position to, took the risk and marched outside. We got within 20 metres of the thousands of protesters whod come to meet us before the cops stopped us in our tracks, then attacked us with batons, pushing us violently backwards and permanently blocking our way. It was shocking to witness, but quite in keeping with attempts by the Danish state and the UN to systematically silence civil society inside and outside the Bella Centre. In the end, like all good disaster movies, it came down to a nail-biting, nerve-jangling finale where it was impossible to predict what was going to happen next. The real action began on the morning of the final day. Amid rumours that, since he had arrived in town, Barack Obama had been locked in closed meetings with small groups of hand-picked countries, those of us lucky enough to still be in the Bella Centre (by this stage the UN had barred all but 90 of the 14,000 accredited NGO participants  Id got in with my press pass) awaited his Friday morning speech with something approaching the hysteria that greets a film star. Our leading man had finally arrived. Would he be able to use his unprecedented stock of international goodwill to break his own negotiators intransigence, stand up to the battalion of corporate lobbyists working tirelessly to sabotage things, and somehow charm everyone into reaching a half-decent deal? I have to admit to being caught up in the moment. I allowed myself to believe in the Obama fantasy. I forgot, fatally, that hes a US President, and so found myself doubly disappointed when he behaved not as hero but as villain. Delivering a brusque, stern, charmless speech devoid of any new concessions, he had one message for the rest of the world; get in line with what the US wants, which is whats on the table now. Period. Then, suddenly: news! Obama was holding a press conference. What was he going to announce? No-one knew. We stampeded in the direction of the press conference room, to be told that it was taking place elsewhere with just the White House press corps. We should wait, though, because the EU would give their own press conference here straight afterwards. We waited. And waited. Around 9.30pm those with laptops/blackberries got the news first  Obama had announced that there was a deal! The Copenhagen Accord!! What was in it? No-one knew. Ive just discovered that the EU has gone into another round of negotiations so we have to cancel this press conference, sorry, she told us. If theres a deal why are they still negotiating? Something fishy was clearly going on. Charging back towards our computers, I bumped into a developing country delegate. Its NOT a deal. Its still just a draft. Obama cooked it up with a few countries, outside of the UN process, announced it as a deal in a press conference, is already on a plane back to the US, and most developing countries havent even seen the text yet, let alone agreed to it! he briefed me, breathlessly. People are furious! he said before dashing off into an emergency meeting. The UN plenary to discuss the Copenhagen Accord was finally convened well after midnight. Its chair, the Danish Prime Minister, told countries they had an hour to discuss the draft, then they would agree it. At this point, fury bubbled over. 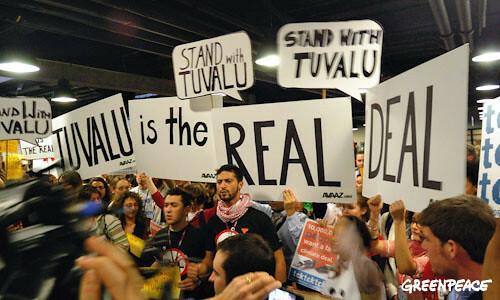 Tuvalu  a tiny low-lying Pacific island, was the first to refuse to sign: It looks like we are being offered 30 pieces of silver to betray our people and our future, its representative fumed. Bolivia and Costa Rica backed them up in rejecting the Accord. Other developing countries also refused to bow to pressure. The Venezuelan delegate, bleeding from whacking her desk so hard trying to get heard, accused Obama of a coup against the UN. This is asking Africa to sign a suicide pact, an incineration pact in order to maintain the economic dominance of a few countries, railed Lumumba Di-Aping, chair of the G77 group of developing nations. The rumpus carried on throughout the night. Unable to stand any more, I snuck out sometime in the wee small hours to join the sub-zero protest outside, and then get some sleep. A bleary-eyed compromise was finally reached mid-morning  ultimately pushed through by the UK. Because of steadfast opposition by several countries, the UN would merely note the accord. This gives it no standing of any kind. But there was a final, desperate sting in the tail: only developing countries who sign up to it will get access to any of the financing. Immediately, the blame game began. The US and UK, who persist in calling it a deal when it patently isnt, say the fault lies squarely with China for blocking progress, and with the developing nations who prevented the adoption of the pathetically pointless Copenhagen Accord. This is laughable. There is plenty of blame to go round  hardly anyone comes out of this well. But the true villains of this particular piece were the high-emitting industrialized nations  and the US most of all  who came to the table prepared to offer so little whilst demanding concessions from everyone else, and who then imposed a bogus deal when the UN should have simply admitted failure and begun a re-evaluation of the entire process. Perhaps the blame also lies with a decision-making process that allows the narrow self-interest of the most economically powerful nations to ride roughshod over the needs of nations most affected by climate change. A fair and far-reaching deal wont be possible until this power balance fundamentally shifts. It may feel to many of us that, today, hope is in short supply. The best hope I can see is if the people of the world, appalled by the way their leaders have failed, take matters into their own hands and create political will where now there is none. 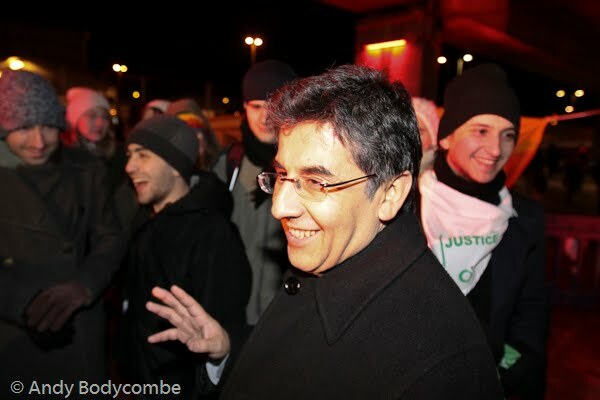 When we were protesting outside the Bella Centre in the middle of that final desperate night, Pablo Solón, Bolivias Ambassador to the UN, came out to thank us for our support. There will be a sequel to Copenhagen. Its now down to each and every one of us to join the growing global movement of people determined to make sure it is not another big-budget disaster. See our full coverage of the Copenhagen summit here. On obstacles and personal beliefs. Urgent: Yasuní's future hangs by a thread. Take action now! Ecuador's President seems to have pulled the plug on the plan to keep oil underground - help change his mind! Don't let them steal our future! Climate campaigners confront the International Chamber of Commerce. Blame Canada  but dont blame Canadians! Is hell really other people? *Vanessa Baird* concludes with some sobering facts and reflections on equality. *Jonathon Porritt* and *the Corner House* offer two very different perspectives on one of the big debates of the day. Richard Howlett on his personal high and lows at the Copenhagen climate conference. The way we use (and waste) water has a profound impact on climate change, as experts have been discussing at Klimaforum09. If Copenhagen has proved one thing so far, its that environmental and economic issues are one and the same. Even global warming is being used for economic gain. But we can’t buy ourselves out of ruin, argues Jeremy Seabrook. Repression on the streets and deadlock in the talks: Copenhagen is not looking good. Where am I, Copenhagen or Guantanamo?! Yesterday's climate march was amazing, but the detention and mistreatment of 900 of my fellow protesters is unbelievable. COP a load of this! Jess Worth turns up at the Copenhagen climate summit, tunes in, freaks out, then starts to get a grip. Confused by all this talk of carbon markets? Check out this entertaining and enlightening little video. The *NI* guide to how you can take action for climate justice, whether you’re in Copenhagen, in a major city or online. Corporations have taken over the climate agenda. *Oscar Reyes* reveals who, how and why. Who's the biggest corporate villain in Copenhagen? You decide!